Growing up in Northbrook, Illinois, James Sanchez was a diehard University of Michigan Wolverines fan. Sanchez’s youth teams frequently played in the state, and his youth teams attended Wolverines games several times each year. Next year he will join the Wolverines as a player. 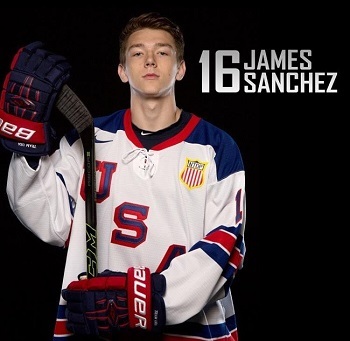 On Jan. 21, however, Sanchez got a preview for what that might be like when he and his U.S. National Under-18 teammates took on the Wolverines at Yost Ice Arena. Despite the National Team Development Program losing 5-2, Sanchez said the experience was a thrill. “It was awesome to play there,” he said. “All week, I had been excited to play there. I never played at Yost prior to that game, but I had been there to watch games. The game was cool. I remember scanning the arena during warm ups and looking at the crowd. It was cool to look down and see the team I’m going to be playing for next. Now Sanchez is focused on finishing his time with the NTDP on a high note. The 6-foot-1, 184-pound forward has seven goals and 16 points this season and credits the program for his development and growth. Sanchez credits the intense practices for helping him develop as a player. “Practice really ties into games,” he said. “Coach [Danton] Cole knows what he wants us to do. We can go back and see on video that we have done something in practice before. It is the little things. We work on the penalty kill in practice, and you can see the improvement. The repetition makes you think. Wearing the USA sweater never gets old for Sanchez, especially in international competition. Part of the things to come is the IIHF Under-18 Men’s World Championship next month in North Dakota. It’s an event Sanchez can’t wait to participate in. “We need to keep training and start working on doing the little things off the ice that will help us perform at the level on the ice,” he said. “In our U17 year, we had to grind through the whole year and we didn’t win too many games. This year, this team is going to battle for each other each night. One of his best memories has been spend spending time with his teammates. It’s a special bond that the players share.